With the 2010s having begun their final year, now is a good time to look back on the past decade in United States Mint coin production and highlight the most significant releases. Secondary market performance and mintages have been considered, but other factors were even more important – especially a coin’s likely long-term significance for American numismatics. In many cases, this stems from the fact that they were the first issues of their kind or otherwise marked a departure from previous U.S. coinage. In addition, the popularity of the issue and/or the coin’s design, or its status as the first of a new series, played a role too, especially since some such coins outperform their lower mintage peers. The past decade has been a remarkable one for modern U.S. coins in which the mint issued a diverse range of coins that embraced new minting technologies and modern designs while continuing to celebrate our 226-year numismatic heritage. It included several coins that many people thought the Mint would never issue, like the first curved issues and others that marked a major shift in the aesthetics of U.S. coinage, such as the 2017-W American Liberty $100 high-relief gold coin that featured an African-American Lady Liberty. There were many other notable issues besides those discussed here, like the first and only gold version of the Kennedy half dollar and gold versions (created with modern digital minting techniques to improve on the originals that were made using the Janvier lathe method for creating dies) of the 1916 Liberty dime, Standing Liberty quarter, and Walking Liberty half dollar. 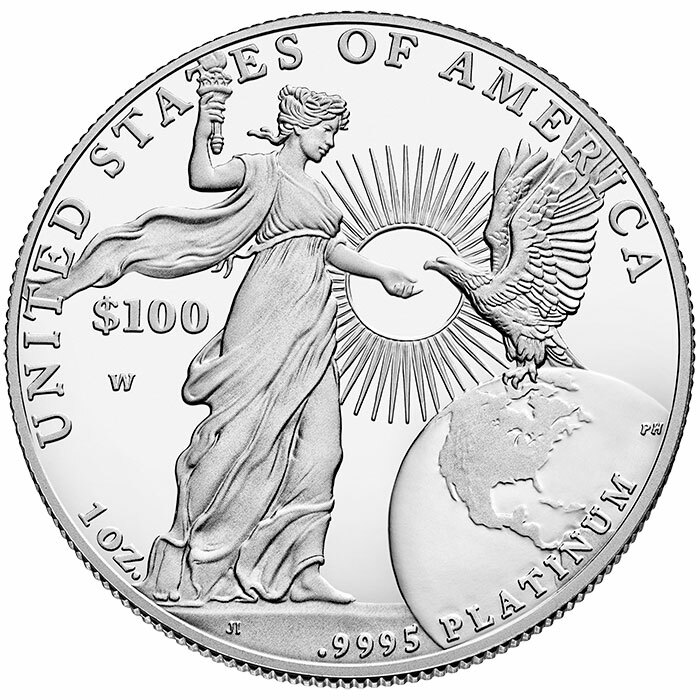 Series begun the previous decade or earlier continued, and several new coin series were introduced, such as the American Palladium Eagle, the American Innovation $1 coin and several silver medal programs. The collector version of the Volcanoes America the Beautiful five-ounce silver coin is likely to remain the key to the ATB series irrespective of the final mintages of the coins that have yet to be released. With a mintage of 14,863 coins, it has already been surpassed by the 2017-P George Rogers Clark National Historical Park coin as the lowest “P” issue and lowest overall for the series. 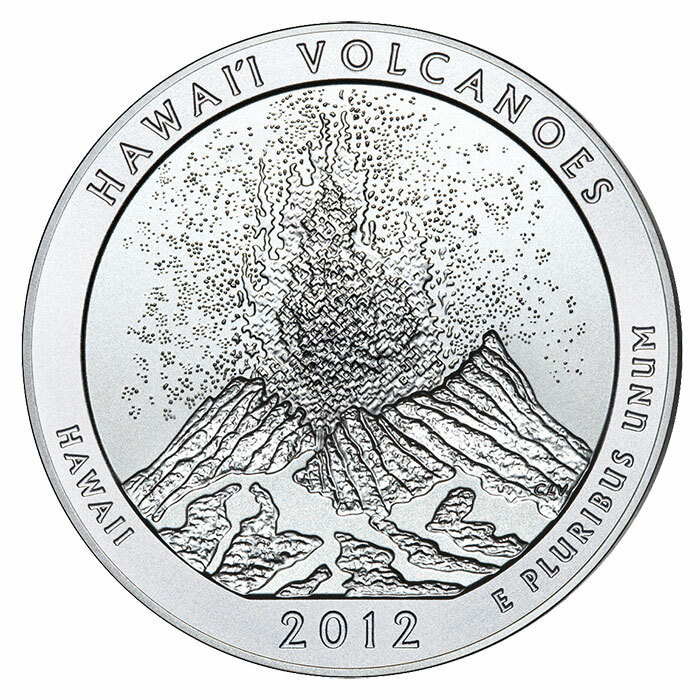 The Volcanoes “P” coin was only available from September 24 until the middle of January 2013, when sales ended, so this is the likely reason the mintage was low. 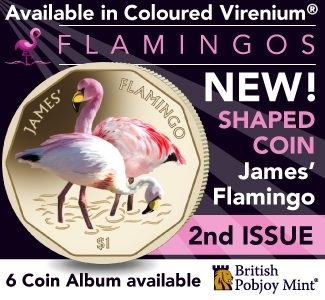 The Volcanoes coin is also tied with three other issues as the lowest-mintage bullion issue so far at 20,000-coins. It has long been the most popular issue of the series probably because of its unusual and dramatic design by Charles Vickers of an eruption on the Kilauea Volcano. Initially sold by the Mint for $205, the coin today sells for between $500-700 ungraded and SP70 examples have sold for over $1,000. Issued to mark the 100th anniversary of the 1913 Buffalo nickel, whose design was the basis for the American Buffalo Gold one-ounce proof and bullion coin series launched in 2008, this coin sold 47,836 pieces. The coin had no preset mintage limit and was sold for four weeks starting on August 8. Initial sales were very strong and were boosted because the coin was sold by the Mint during the August ANA World’s Fair of Money in Chicago, where PCGS and NGC did on-site grading and gave the coin special show labels. The Chicago labels proved to be classic “pop and drop” items that briefly sold for thousands of dollars but today carry no premium over other graded examples. Raw coins are today selling for $1,400, $200 less than the initial price because of the decline in spot gold. However, coins graded PF70 start at $1,400 and go up from there. Long before its release, collectors of the series had been asking the Mint to produce a reverse proof version of the Buffalo gold following the success of reverse proof American Silver and Gold Eagles. Because there are no announced plans for another coin of its type, and it is the only other variety of this series besides the standard proof version and the 2008-W burnished coins, this coin is expected to remain in demand. Until the release of the clad half dollar, silver dollar, and $5 gold piece issued in 2014 to mark the 75th anniversary of the Baseball Hall of Fame, the U.S. Mint had been rather conservative compared to other world mints in its approach to new minting technologies developed in the 21st century, limiting innovation primarily to the use of special finishes like reverse proof and enhanced uncirculated. Mint officials were undoubtedly aware of the popularity of world coins issued in non-traditional formats, especially of curved coins. The 2014 issues, which are concave on their obverse to resemble the curvature of a baseball glove, and convex on their reverse to resemble a baseball, were produced with the cooperation and assistance of officials from the Paris Mint and the Royal Australian Mint, both of which have extensive experience producing curved coins. 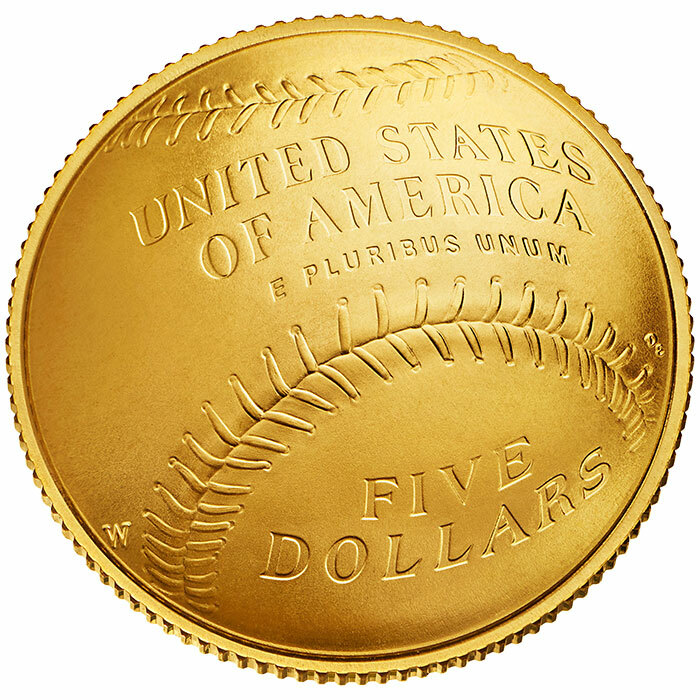 The 2014 baseball coins were a big hit with collectors, with the gold versions selling out of their 50,000-coin mintage the first day of sale (March 27), and the silver dollars also selling out of their 400,000-coin mintage within the first two weeks. For a while, these coins–especially those bought and graded at the Whitman Baltimore Expo where they were sold on release day–did well on the secondary market. But over time their premiums have continued to decline, and today ungraded examples can be obtained at or slightly below the original issue price. The likely reasons for this performance are that many coins were bought by dealers to sell, rather than by collectors to hold, which has resulted in more supply than demand. As the first curved coins issued on a quintessentially American theme, these coins should remain of long-term numismatic significance. The $10 gold First Spouse series (2007-2016) is the only American coin series issued to honor a group of real American women, many of whom played larger roles in history than is commonly known. Many collectors of the program continue to believe that the series, which includes some of the lowest-mintage modern U.S. coins ever released, remains undervalued. But the market reality is that today almost every coin in the series trades in auctions and on the wholesale market for approximately its gold value, with just a small number that command a slight premium. Many retail sellers continue to charge higher premiums for many of the coins, but buyers should understand it will likely be difficult to recoup their investment unless gold moves much higher. However, there is one standout, and it is not the lowest-mintage coin. 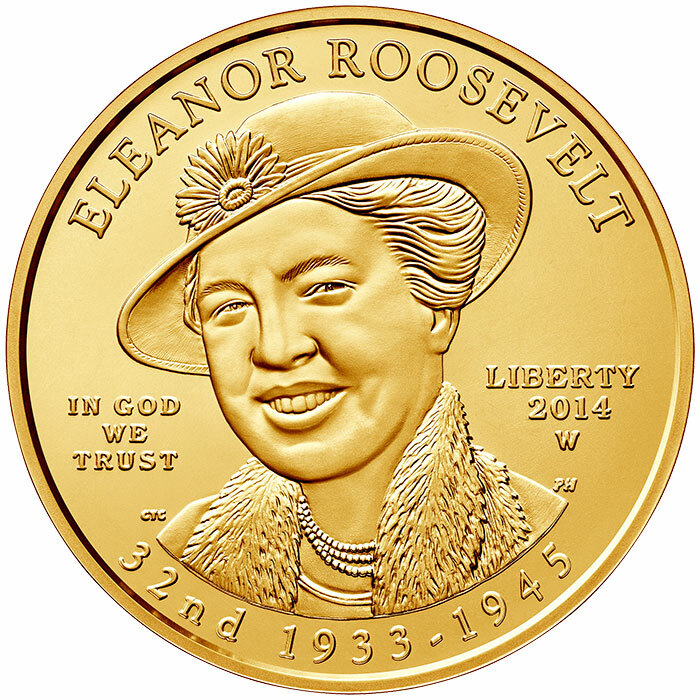 It is the 2014-W Eleanor Roosevelt pieces, especially the burnished uncirculated version, but also the proof coin – both of which are hard to find and today sell for $1,000 and more. Launched on September 4, 2014, these coins sold out in April 2015 with final sales of 1,886 coins uncirculated and 2,377 proof pieces. They command a solid premium because of the unexpected end of sales after only nine months and the popularity of the issue and the woman it celebrates. Wife of Franklin D. Roosevelt and niece of Teddy Roosevelt, Eleanor Roosevelt was an activist for justice and lectured and wrote widely. After the White House she served as a US delegate to the United Nations and the first chair of the UN Commission on Human Rights. Launched on December 3, 2015, the 2015-W American Platinum Proof was the only platinum coin the Mint offered that year. 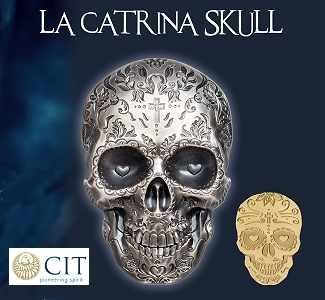 No bullion version was minted due to a shortage of platinum planchets. The proof coin was the first of a two-coin series on liberty and freedom with the 2015 coin’s reverse depicting “Liberty Nurtures Freedom” with an image of a Lady Liberty figure holding a torch in her right hand, while her left hand is stretched out towards the beak of an American eagle perched on the globe that represents freedom. Designed by Joel Iskowitz, this coin is certainly one of the best of the platinum series, whose proof coins have featured many outstanding designs. But in this case the coin’s overall significance has a lot to do with the fact that it sold out in minutes from the Mint at $1,200, with its final mintage being 3,886–the lowest of any proof platinum pieces and one of the lowest-mintage modern coins ever released. The only lower-mintage platinum coin is the 2008-W burnished uncirculated $50, half-ounce coin with a mintage of 2,253. The 2015 proof is off its peak, as typically happens, but it still brings at least $2,000 raw and $2,500 in PF70. Not long after the coin’s release, PF70 examples were bringing $3,500 and up. The American Liberty high-relief gold coin and accompanying silver medal program was the brainchild of the Citizens Coinage Advisory Committee (CCAC) while it was led by former chairman Gary Marks. Although by law the CCAC is tasked with reviewing coin and medal designs, it is also permitted to make a limited number of recommendations for new programs. CCAC members under Marks’ tenure frequently argued that it was time for a new and modern interpretation of Lady Liberty, rather than endlessly recycling the classic versions that were issued from the Mint’s first coinage in 1793 through the end of Walking Liberty half dollar series in 1947. 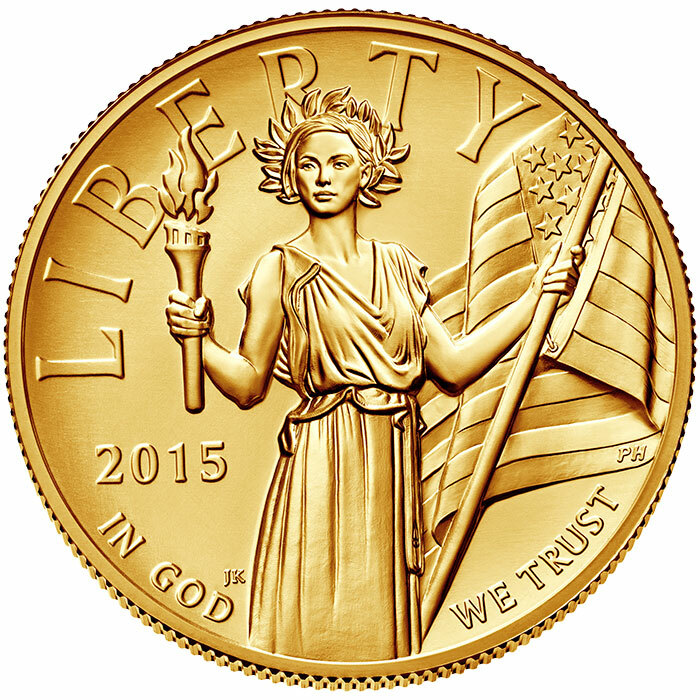 The 2015 gold coin featured an obverse by Justin Kunz with a modern-looking Liberty wearing a wreath crown, holding a torch in her right hand and an American flag in her left hand, while the obverse by Paul Balan showed an American eagle in flight gripping a branch in its talons. This coin is only the second high-relief gold issue in the Mint’s modern era after the 2009 Ultra High Relief double eagle that recreated the 1907 version with modern technology. It did not sell out instantly but sold about two-thirds of its 50,000-mintage during the first week following its July 30 release and the remainder by 2016. It was not a big secondary market winner apart from MS70 examples but over time has maintained its value (initial issue price was $1,590, which fluctuated over time). The silver medals were an instant sellout of their 25,000-mintage when released in August 2016. The 2015 American Liberty coin and 2016 medals of the same design were intended as the debut of a new series, but the Mint plans to introduce a new series called Virtues of Liberty in 2019. The 2015 issues were followed by the 2017-W American Liberty high-relief gold coin released on April 6 to coincide with the Mint’s 225th anniversary. 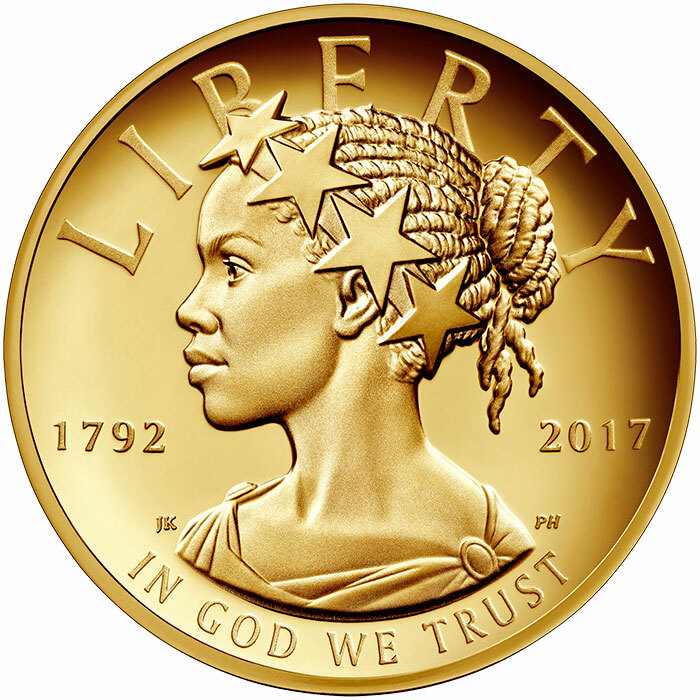 The coin received a lot of mainstream press coverage and was the first to feature an African-American female as Liberty on its obverse, shown in a left-facing profile wearing a crown of stars inspired by the Statue of Freedom that rests at the top of the U.S. capitol, a tribute to the emancipation of slaves. On the reverse appears an American eagle in flight. The coin sold over 14,000 pieces out of the gate, but sales soon slowed and to date it has sold 29,807 coins out of its 100,000-mintage. 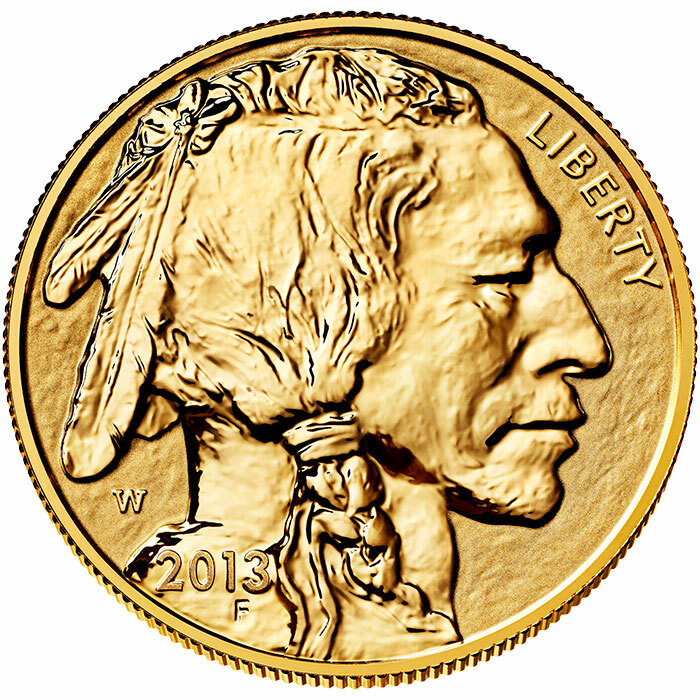 Unlike the 2015 Liberty gold coin that was a business strike issue, the 2017 issue was struck in proof. For those who could not afford the roughly $1,700 price tag for the one-ounce gold coin in early 2018, the mint released a $10 face value, one-tenth-ounce gold version that had sold only 25,735 of its 135,000-maximum mintage by the end of 2018. In both cases, the Mint probably over-anticipated the level of demand and would have been better off with either a lower mintage or perhaps selling it (as some products have been) with orders taken during a limited window. These coins are significant in the annals of modern U.S. coins because they represent a new aesthetic – one that has been embraced to a greater extent than many critics of the approach anticipated. The silver medal version was sold first as a single medal and later in the year in a four-medal set with different finishes. 32,507 sets of a maximum mintage of 50,000 were sold by the end of 2018 when sales ended. 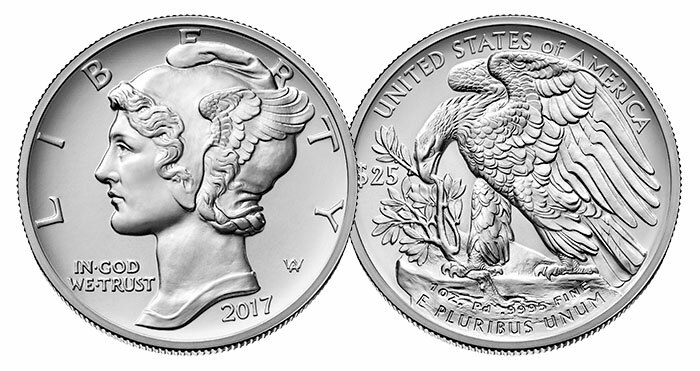 The 2017 American Palladium Eagle had a lot going for it when it debuted in September 2017. 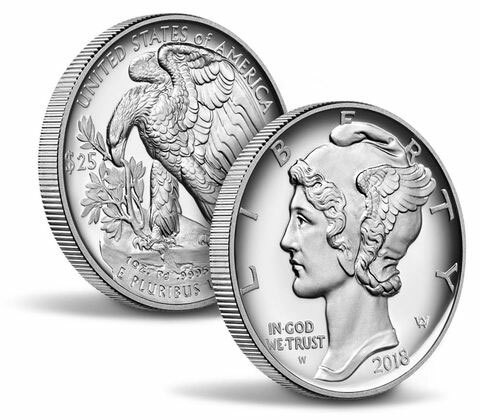 Palladium spot was rising; it was the first coin of its type and the first new American Eagle program in 20 years when the platinum series was launched, and the 15,000 coins produced were not enough to meet demand. 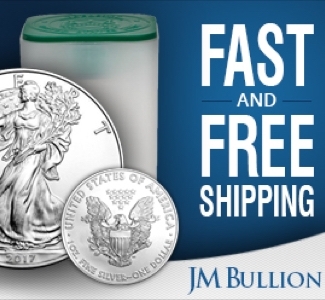 Like the 2015 platinum proof, the production level for the new palladium bullion issue was impacted by difficult sourcing palladium planchets and following an instant sellout from the mint to its distributors, the palladium bullion coin took off in the secondary market, especially for MS70 examples. Ungraded pieces were initially available for about $1,100 and MS70 for $1,200. Palladium spot has continued to rise, helping to support high values for the coin, which currently sells for $1,500-2,000 raw and between $2,000-4,000 in MS70. Issued in stunning high-relief, the 2017 palladium coin’s success has a lot to do with its gorgeous appearance. The obverse, based on the obverse of the Winged Head Liberty dime but with its details and engraving enhanced with modern minting technologies, was issued in gold the previous year. The reverse, based on a medal Adolph Weinman designed in 1907 for the American Institute of Architects showing an American eagle perched on a rock clutching tree leaves in its beak, had never previously appeared on a coin. The use of the design was fitting since every other type of American eagle uses a design of a classic issue. 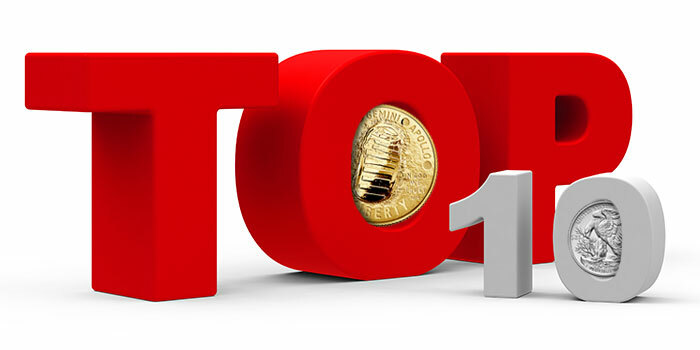 As discussed in my recent overview of the best-performing coins of 2018, the proof version of the palladium eagle was another instant sell-out of 15,000 coins on September 6 and has maintained a solid premium, with values for raw and PF70 coins having converged at the $2,000-level in recent months with the exception of coins with certain labels. The combination of high-relief striking with a proof finish results in another highly attractive numismatic piece that future collectors are likely to embrace. It will be interesting to see if the 2019 reverse proof and other versions after that are as popular as the first two. Collectors may eventually tire of the design, and the novelty of a new eagle in a new metal will also dissipate over time. In addition, palladium spot may eventually decrease given how rapidly it has risen in the past couple of years – which would please buyers since it might make future releases more affordable. On January 24, with a launch ceremony to be held at Cape Canaveral in Florida, the U.S. Mint will release perhaps the most highly-anticipated commemorative coin program in decades and one that should garner plenty of mainstream press coverage: the Apollo 11 50th anniversary set of four curved coins, including a clad half dollar, silver dollar, $5 gold coin (each issued in proof and uncirculated versions), and, for the first time ever, a proof 5-ounce silver $1 coin, which is widely expected to be a quick seller (if not an instant sellout). And for the first time, the silver issues will be struck in .999 fine silver. The convex reverse of each coin features a design created and executed by Phebe Hemphill of the famous Buzz Aldrin on the moon photograph taken during the first manned moon landing showing just the reflection in Aldrin’s visor, while the concave obverse, designed by Gary Cooper and sculpted by Joseph Menna who won a public competition, features the famous first lunar footprint of Neil Armstrong. 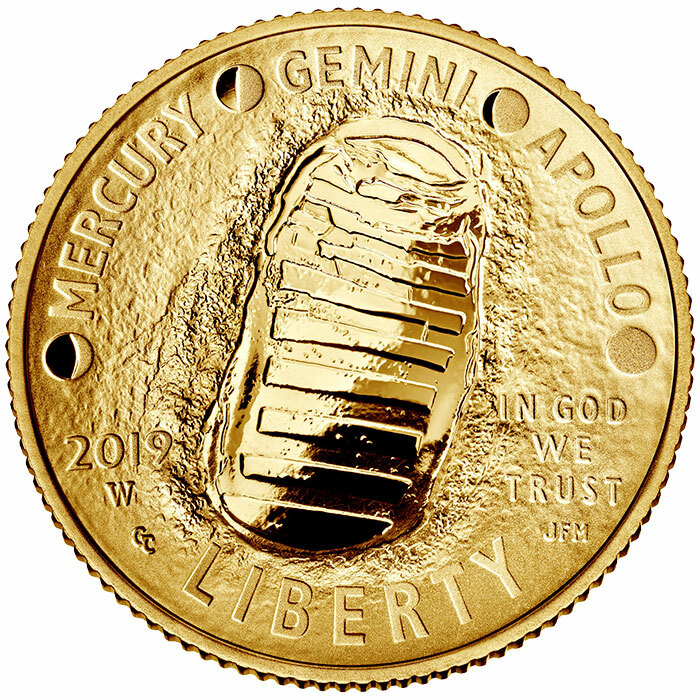 The footprint has been used before such as on the 2009 French coin for the 40th anniversary of the moon landing and on several 2019-dated world coins. Based on images of coins struck in December during a first strike ceremony held in Philadelphia, the version on the new U.S. coins appears extremely well done, especially the way it uses different levels of frosting on different design elements and creates a dynamic image. Whether or not they prove to be secondary market winners, these coins are destined to hold an important place in the annals of American numismatics as fitting tributes to one of the greatest American and human achievements of all time. 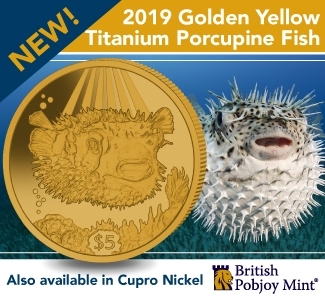 This article seems more like a sales announcement…this totally forgot the 25th Anniversary Silver Eagle Set…experimental finishes, San Francisco Mint, Reverse Proof… and what about the 2016 Centennial Mercury Dime that sold out in in about an hour. I don’t think the 2016 high-relief gold coin featured an African-American as the sentence states. I googled and couldn’t find an image of such a coin. While anyone can make mistakes, Publications should strive to put out accurate information because people learn from reading publications such as Coinweek and others. It’s not good to have people learning things that just ain’t so. A typo that has now been fixed. Thank you for bringing it to our attention.